Steam broadcasting is Valve's answer to massively popular live streaming platforms like Twitch and YouTube Gaming. It's designed to allow Steam users to live stream their gameplay without any additional software. Everything is built right into the Steam client, so all you have to do to start streaming is enable the feature. Compared to other live streaming options, Steam broadcasting is extremely simple. You don't need any additional software, so the barrier for entry is very low. 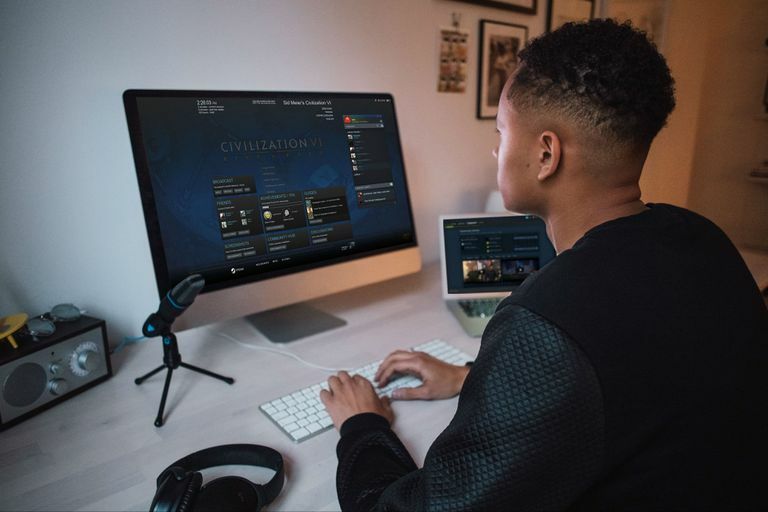 If you have a high speed internet connection, and your computer is powerful enough, you can become a live streamer with the Steam broadcast feature. How Does Steam Broadcasting Work? Steam broadcasting uses the Steam client to record, encode, and broadcast your gameplay, live, over the internet. Like other live streaming software, it allows you to connect a microphone to communicate with your viewers, and you can also choose whether or not to include audio from other applications on your computer. The Steam client includes a broadcasts section in the community area, which can also be accessed through the Steam Community website. This is similar to Twitch and YouTube Gaming in that it provides a central location where you can discover new streamers and find out who is streaming the specific game you want to watch. If nobody is streaming the game you want, all you have to do is change a few settings, launch the game, and you can start streaming it yourself. Before you can stream your games through Steam, you have to set up the broadcast functionality. This has to be done through the Steam client before you start playing a game. Open the Steam client, and click Steam in the menu that's located in the upper left corner of the window. Click the drop down menu beneath Privacy setting. Click Anyone can watch my games to fully enable Steam broadcasting. Select friends can watch my games to prevent strangers from seeing your broadcasts. If you select friends can request to watch my games, you'll receive a prompt whenever a friend wants to watch your broadcast. You can adjust the settings here if your computer or internet connection can't handle streaming high quality video. This is also where you enable your microphone. If you click record my microphone, your viewers will be able to hear you talk. Your Steam client is now ready to broadcast your game streams. Once you've turned broadcasting on, you're ready to start streaming games. This is even easier, since Steam will automatically start streaming whenever you play a game with the broadcasting feature turned on. Steam does give you some options to help make sure your stream is working, and you can also fine tune things once you're actually streaming. Open your Steam library, locate the game you want to broadcast, and click Play. Press Shift+Tab while the game is running to open the Steam overlay, and click Settings if you want to adjust any of your broadcasting settings. If your broadcast is working, you'll see a red circle, the word LIVE, and the current number of your viewers displayed in the top right corner of the screen. If the circle is gray, that means your broadcast isn't working. Adjust any settings that you want. If you forgot to turn on your microphone, you can turn it on. You can also adjust your broadcast stream quality on the fly if you're having internet speed problems or your computer can't handle streaming in high definition. Click OK when you're done, then press escape to return to your game. Your game is now broadcasting, and people will be able to watch it. How Is Steam Broadcasting Different From Twitch and YouTube Gaming? The biggest difference between Steam broadcasting and competitors like Twitch and YouTube Gaming is that it's a lot easier to get started with Steam broadcasting. You don't need any additional software, because the Steam client itself handles everything for you. Steam not only handles all streaming tasks internally, it also has a built-in system for viewers to see and watch your streams. This is similar to the Twitch and YouTube Gaming websites, but it's actually available from right inside the Steam client, which can help expose your streams to Steam's massive global audience. The other main difference is that Steam broadcasting isn't as complex as live streaming on other services, which is a double-edged sword. It's easier to use, but you can't add overlays, dynamically switch between different windows and videos, or do anything else that streaming software normally enables. In addition to these differences, you can only live stream with Steam broadcasting if you have actually bought games on the platform. Free Steam accounts start in a limited state, which is lifted as soon as you spend at least $5 USD in the Steam store, or purchase an in-game item in a free-to-play game like DOTA 2. Limited Steam accounts, prior to making any purchases, aren't able to use Steam broadcasting. That means you can't make an account and immediately start streaming a free-to-play game, but you can unlock the Steam broadcasting feature by actually buying something on the platform. The final difference is that Steam broadcasting doesn't save your streams in any form. Both Twitch and YouTube Gaming preserve streams, or give you the option to preserve them, so your viewers can watch them later. Steam broadcasting doesn't have that option, so your viewers can only watch you live. Get a Refund on the Steam Games You Don't Love!